One of the many items Cute W decided that we needed to pack for our Lake Placid trip was our washers game. Washers is the perfect casual, backyard, while-you’re-having-a-barbecue game. After playing it at a friend’s house, handy Cute W whipped up this frame–there are two of them. Rules vary from player to player, but ours are pretty simple. One person (or team) has 3 silver washers, the other person (or team) has 3 spray-painted washers (I’ve got them piled up at the bottom of the wood). You separate the two washer boards, then take turns throwing your washers. Each side gets points for which hole the washers land in, but points are canceled out if you get the same thing. So, for example, if player one tosses one in the grass, one in the 5 hole, and one in the 2 hole, and then player two tosses one in the 3 hole, one on the wood, and one in the 2 hole, then their scores are 5 and 3 respectively, because the twos cancel each other out. Simple, but trust me: it’s an excellent game, especially for mixed age groups, because young and old can play. If you do teams, it’s a nice social activity while you’re chatting and having a beer. 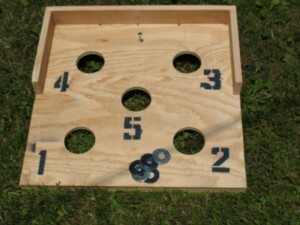 There are a wide variety of variations on how to design and play a washers game, but keep in mind, when folks are enthusiastic enough to create a website devoted to washers, it indicates that they take washers pretty seriously. We prefer to sort of wing it. For us, that’s the spirit of the game. Check out the International Association of Washer Players , Washer Game Players, or Bomb at Washers for more information, variations, and rules. Built a washer game today off your design thanks. The board’s resting on another board that brings it 3 1/4″ off the ground, and the 2′ x 2′ board itself is 1/2″ thick. Hope that helps. What is the space between 1&4?? @Maykayla, On ours, the space between the top of the 1 hole and the bottom of the 4 hole is slightly more than 7.5 inches. What is the distance from the back board to the screw & how much of the screw needs to stick up? Our bolt (I think you mean the bolt, yes, that sticks out that the washer could potentially catch onto to win?) is 3 inches from the back board and 7 inches from the top of the 5 hole, and it sticks up 1.5 inches.